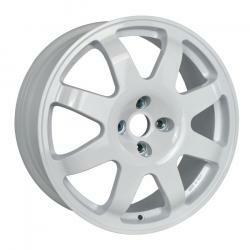 SB9 Ragno is the 17-inch replica of the classic wheel for Renault Clio Williams, the legendary rim for rally with the unique “spider-shaped” design. Manufactured in Italy, the wheel is made of aluminum alloy cast under low pressure and submitted to heat treatment, gaining extreme strength and lightness. SB9 Ragno is available for Renault Clio Williams and Group A, but can be machined in many different applications upon specific request.